The Value of Lost Load (VoLL) is an indicator of the economic value that consumers place on the energy not served in case of a supply disruption, e.g. an electricity outage (blackout). VoLL is broadly used by industry and regulators for benchmarking the operating conditions of an energy system. The perceived worth of the reliability of the energy system can be used for assessing the economic convenience of future improvements, e.g. infrastructure investments, or to assess the damages caused by disruptions. This report first presents the main methods used to produce estimates of the VoLL for different types of consumers. Then it provides estimates on the VoLL of electricity supply for households in three countries: Estonia, the Netherlands and Portugal. These three EU member states enjoy different levels of security of energy supply, which can be characterised as (relatively) high for the Netherlands, medium for Portugal, and low for Estonia. These different levels of security of supply are important in the context of the results. 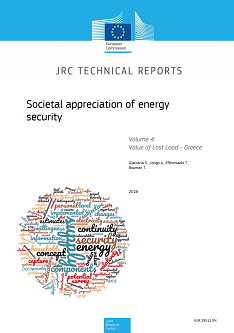 The authors designed two surveys, covering different aspects connected with security of energy supply, applying comparable econometric analyses to survey data from the three countries. A statistically representative sample of households from the three countries assessed scenarios of a blackout through a discrete choice experiment (DCE). This report illustrates the methodologies incorporated for the DCE and the subsequent results. In particular, we estimated the households' willingness-to-accept (WTA) a larger number or duration of power cuts and what compensation would be required, as well as their willingness-to-pay (WTP) to avoid such outages, in monetary terms.